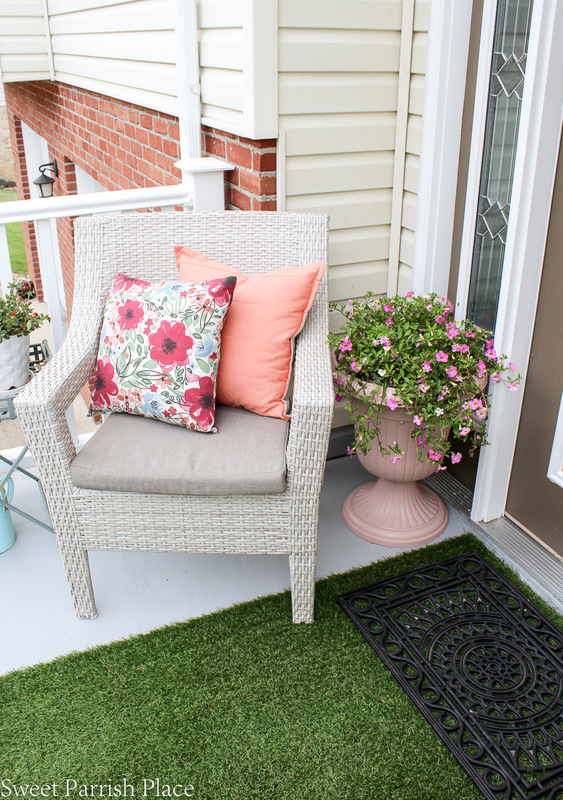 This is a tour of our new landscaping and Summer front stoop with blush pink accents. Hey friends! I totally wanted to have this post ready for you several days ago, but life got in the way. Earlier in the Spring, we had most of our landscaping in the front of our house torn out, and we had it redone. 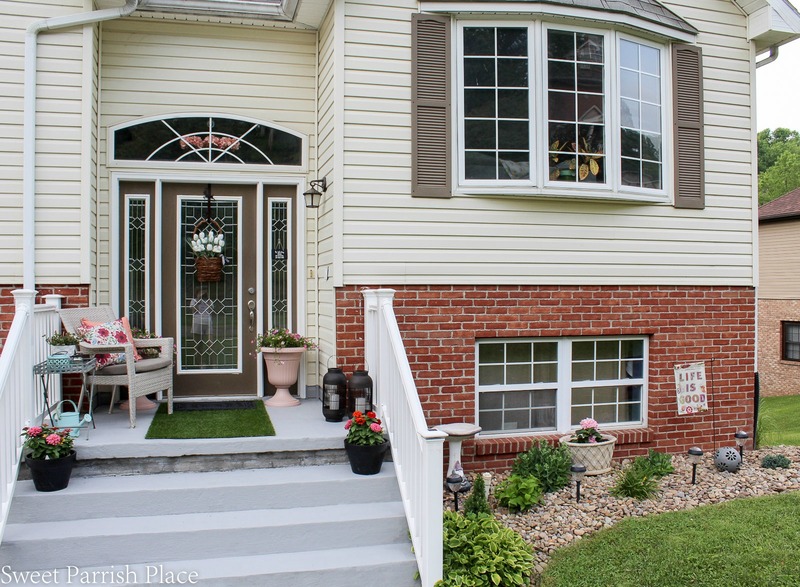 So I wanted to share our new landscaping and summer front stoop with you guys. The landscaping is something that has been on our list of home improvements since we moved in, and we finally got around to it. This was not a DIY project. We decided it was worth it to pay someone to do this job. They had it all done in two days. 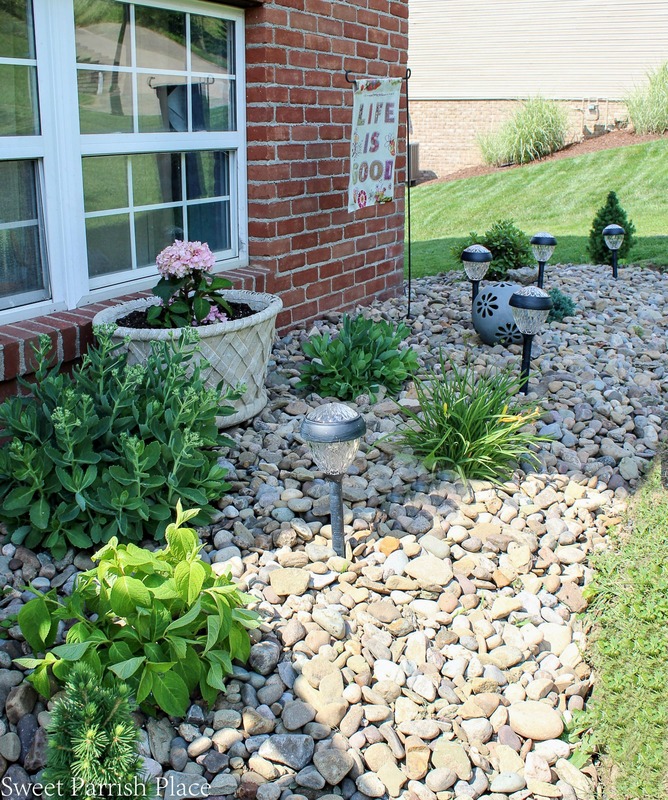 Before we get started, let me share a photo of what the landscaping previously looked like. this is a photo from Christmas. I couldn’t find another one because I rarely took any photos of this view of our home for the blog, because of the fact that we hated the landscaping. As you can see, we had a very large bush there on the corner of the home that was probably pretty at some point, but it was old and overgrown, and it needed to go. 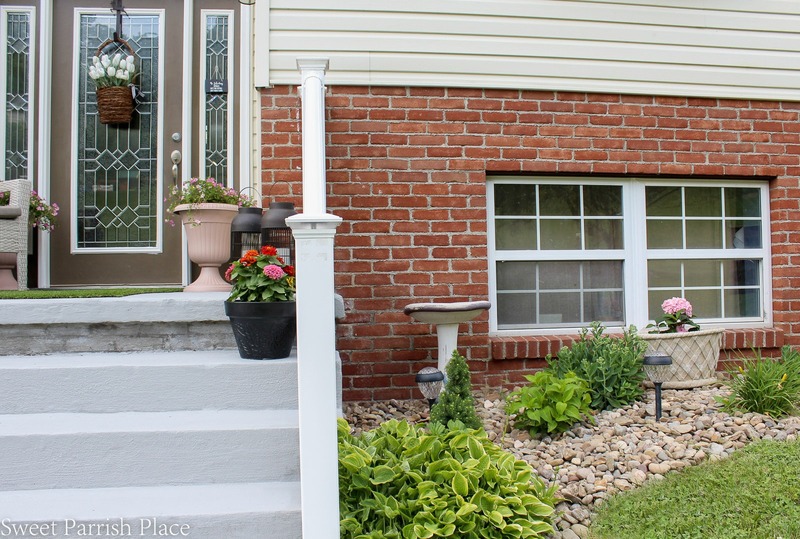 If you look at the photo above, and the photo below, you will see that there used to be a large ugly bush in front of the two downstairs windows that was even visible, so tearing out that bush and exposing those windows made the house look very different. And much better. Keep in mind throughout this tour that the plants that were planted are small right now, and they will grow and fill in very nicely over the years. We worked with our landscaper to plan where everything went, so that nothing would be overcrowded once they are fully grown. We also decided to go with river rock instead of mulch. It was more expensive initially, but in the end it will save us money, because we don’t have to pay to buy mulch every year. So this is much lower maintenance, and it fits well in our neighborhood, because a lot of people use it. Our landscaper really sold us on it, and we are very happy with the results. 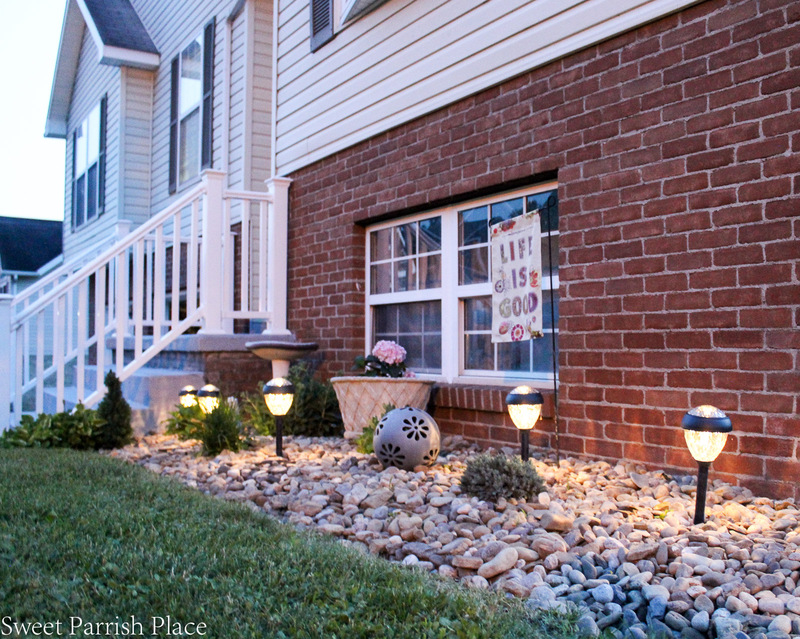 We also added some solar lights, which look really pretty when it gets dark. I have included some photos at dusk, and some in the day so you could see the lights both on and off. We ordered these lights through Wikibuy, and they are from the Better Homes and Gardens line at Walmart. 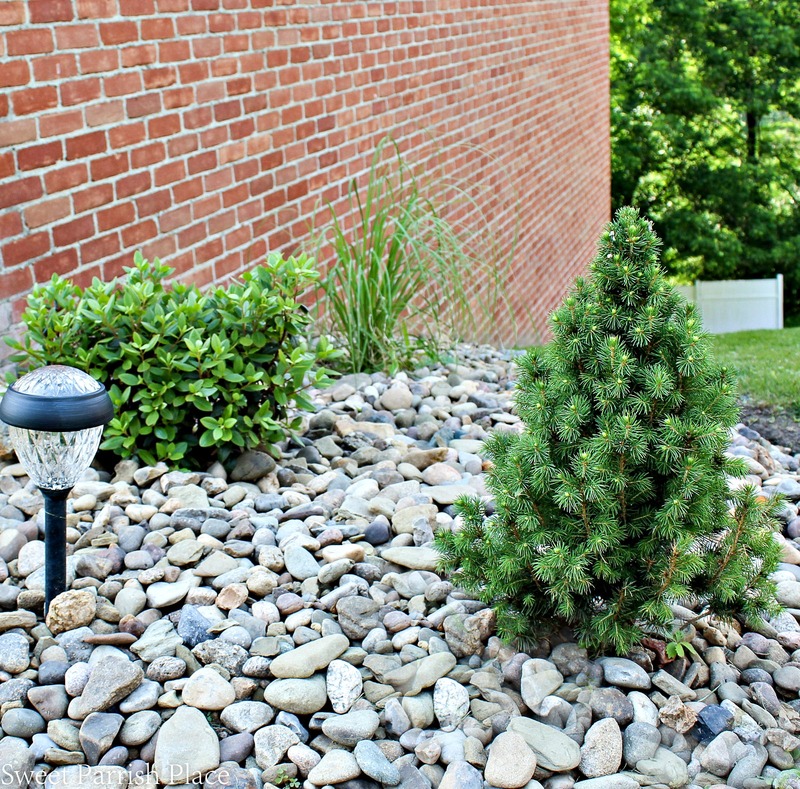 We planted two of these little pine trees, they should get about 5-6 feet tall or so. To the left in the photo below, that is a rhododendron bush. It will get beautiful flowers on it each spring. And the grassy plant in the back will get much larger than it is right now. We decided to place a planter in the landscaping in the center of the two windows. I read that you could plant hydrangea in pots, so I decided to give it a whirl. I hope it does well! We also have a hydrangea over in front of the bird bath that we planted three years ago. We didn’t have it removed. It has yet to bloom for us though, so we are hoping it will this summer. 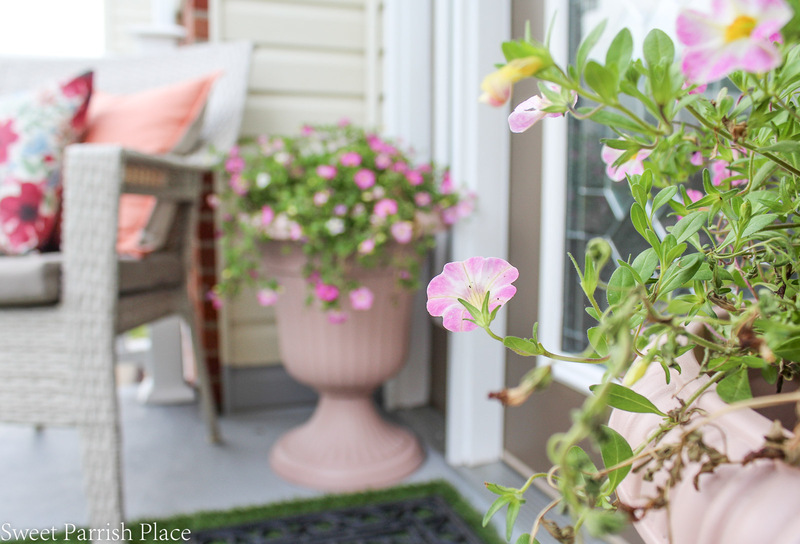 Let’s take a look at our summer front stoop. Having a large wraparound porch is my dream, but for now, this is what we’ve got, so I make the best of it. 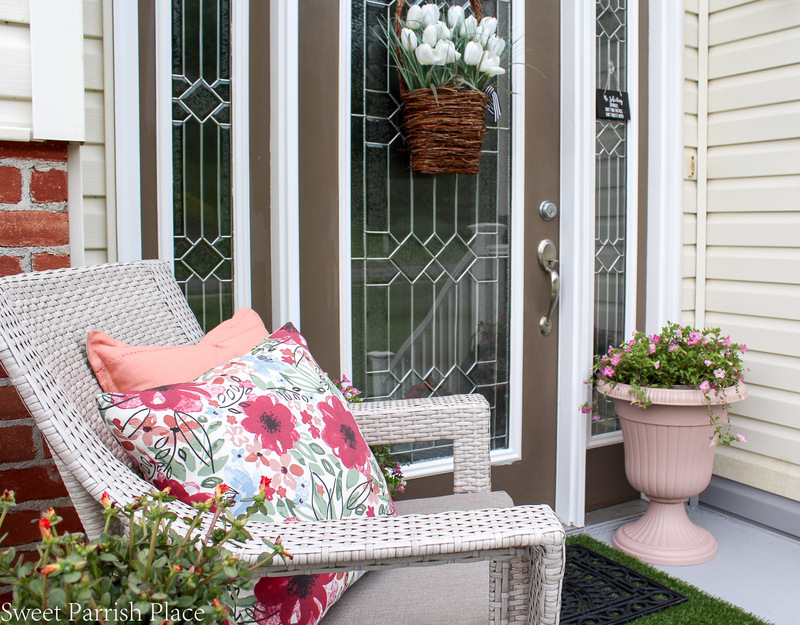 Last Spring we gave our front stoop a little makeover with porch paint. It was looking a little worn from all of the snow we had over the winter, so we freshened it up with another coat of paint last weekend. 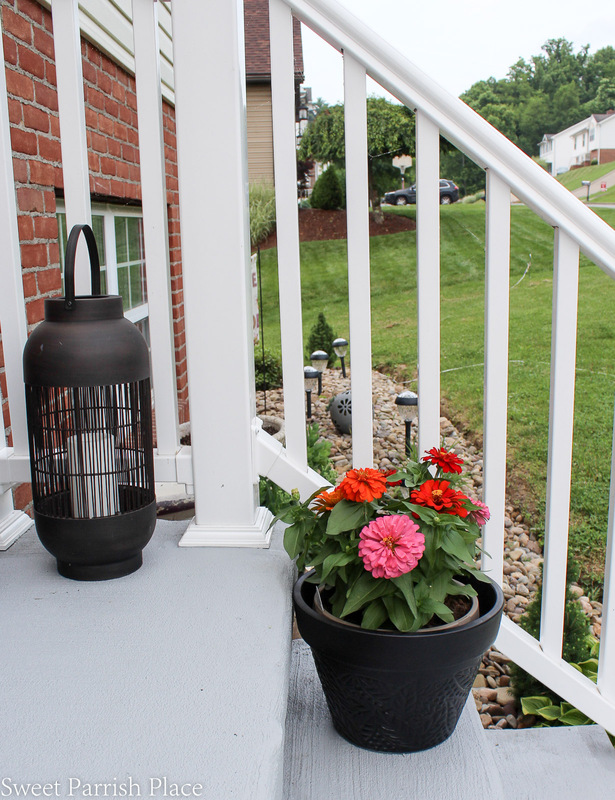 We also replaced the hand railings a couple of years ago, and you can see that reveal during a fall tour I did. 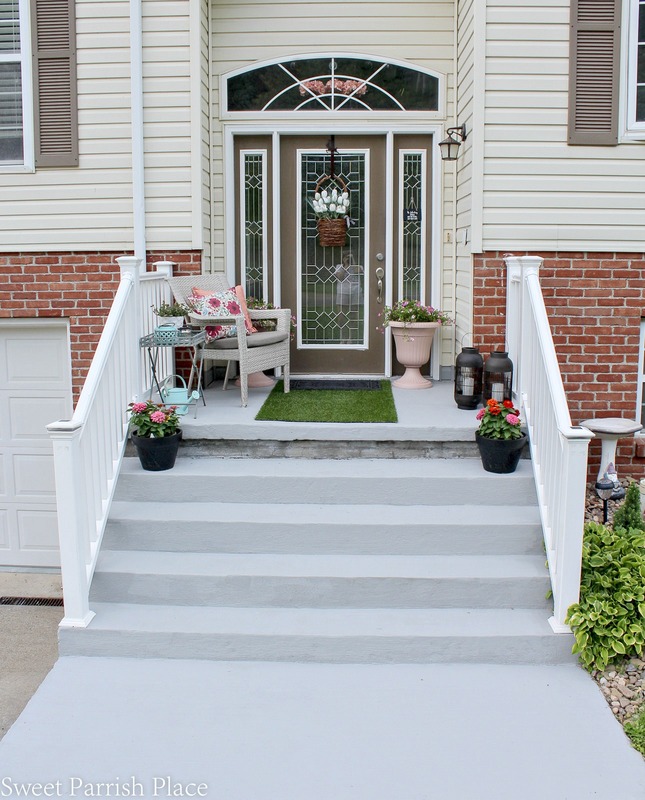 We also had our concrete stoop and stairs resurfaced because it was starting to look crumbly. But to be honest, that was only a temporary fix, so in the future we are going to have to find a more permanent solution. We could have the whole thing torn out, but that will cost upwards of $5,000. And this is not our forever home, so we are trying to make this last as long as possible. We have also considered having the whole thing tiled, or possibly adding composite decking right over top of the concrete. But all of that is for the future. The chair we placed out here is a new purchase from Target. 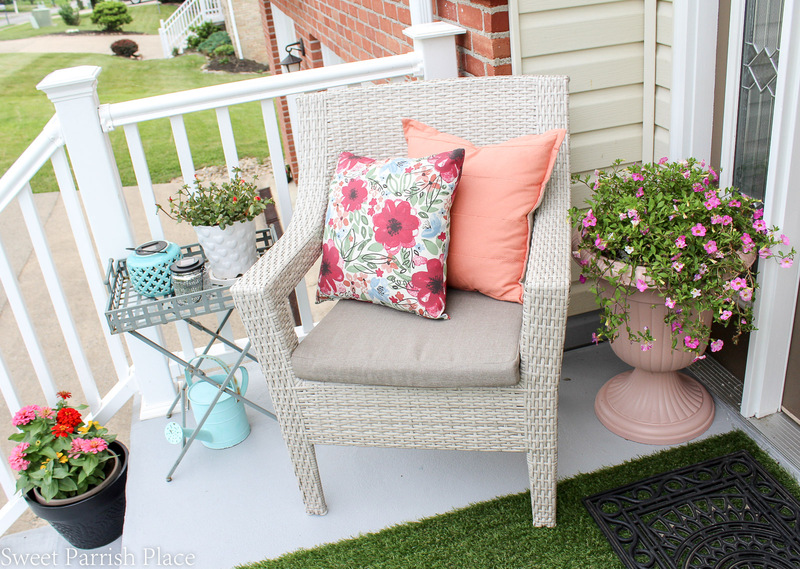 I really love the light color of the all weather wicker, and one or the other of us sits out here quite often. The metal side table was a Target purchase from a couple of summers ago. It is starting to rust slightly, but I actually like the patina. I painted this pot and the matching one on the other side with a stain black spray paint. They were looking a little worse for the wear. They look brand new now! The flowers are Zinnia’s, and this is the third summer I have used them because they do great in full sun, which is what we have out front of our house. This year, I went the lazy girl route and bought all of my flowers in containers that would fit in my planters. So I just plopped them down in. Last summer we lost everything while we were on vacation because it rained so much that all of our flowers dies. I figured this would be better, because if we get excessive rain, we can just pick them up out of the pots, pour out the water, and let them drain. I also painted these urns. We have had these out front since we moved in here and I was tired of the brown color they were. So I decided to go with blush! I used a spray paint from Krylon in the color Wild Rose. And I really love the way they turned out. It is a very subtle pink that is not too in your face, but it adds a slightly feminine touch. 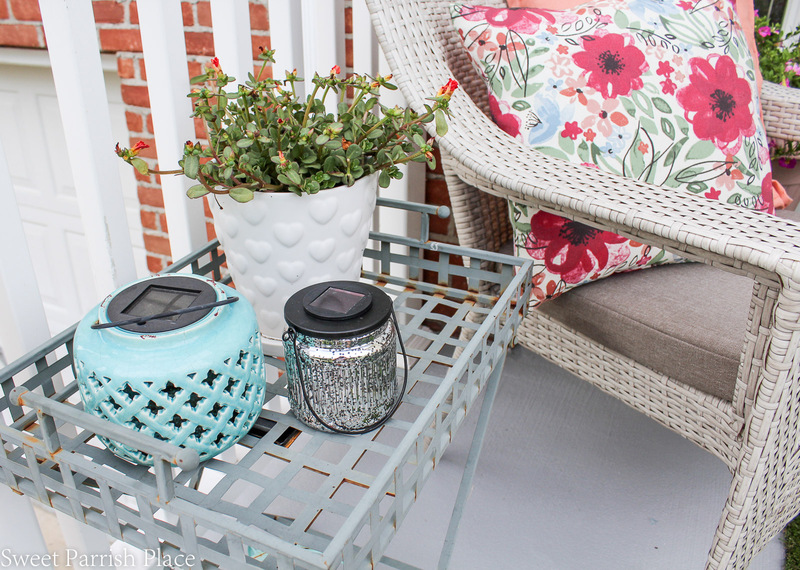 To spray paint planters, all you need to do is clean them really well, and then spray them with several light coats of spray paint. Easy peezy! 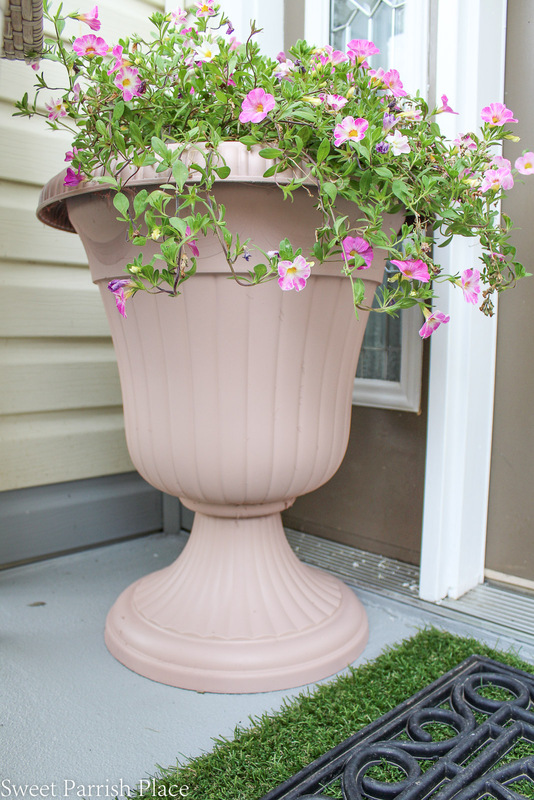 I thought these pretty pink flowers were perfect with my newly painted urns. I’m a sucker for hearts, so when I happened upon this white heart pot at Marshall’s it had to come home with me. The two solar lanterns out here look really pretty in the dark. 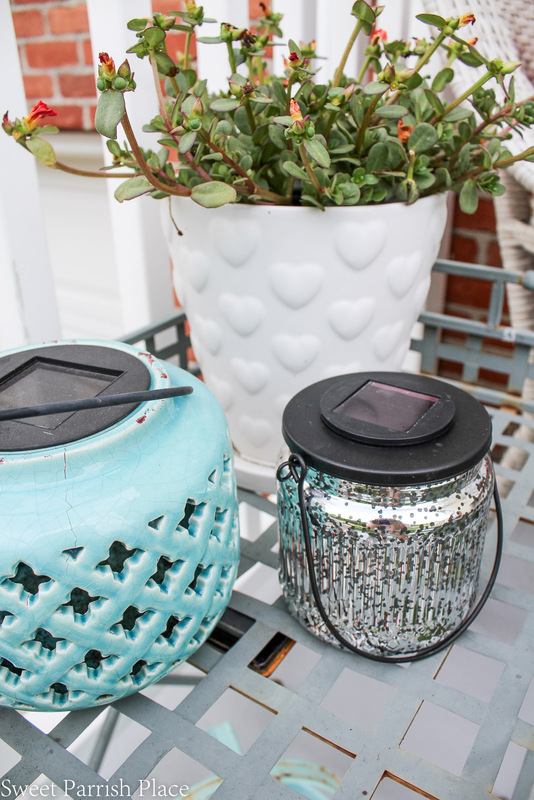 The Mercury Glass lantern I found on Walmart’s website. 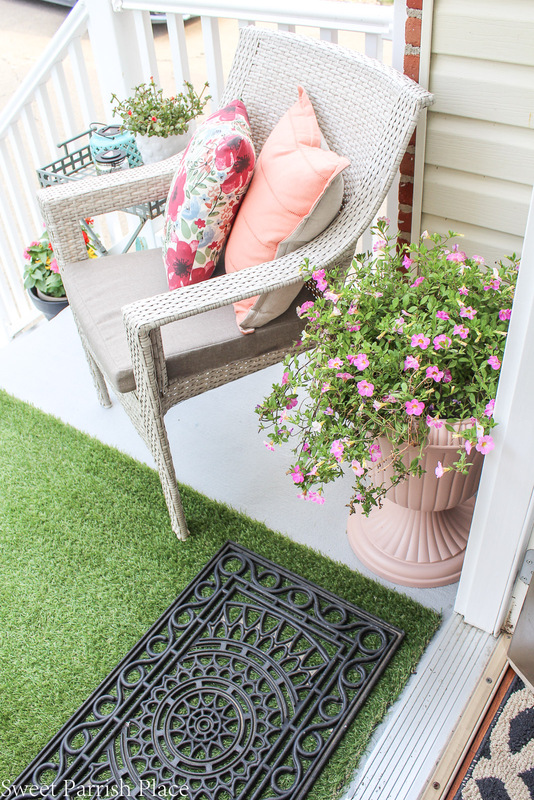 I just love this artificial grass rug that I bought last summer! I love the touch of retro it brings to the front stoop. And it can easily be hosed off. Which I did before placing it here for this summer. 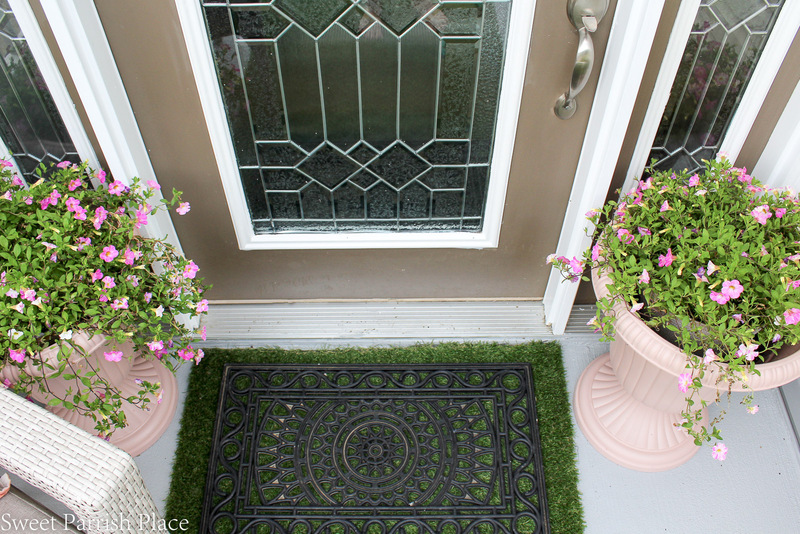 I decided to layer this rubber mat over the rug, because if people have dirt on their feet, I would rather them wipe it on the rubber mat than the grass rug, and I like the way it looks as well. I also gave all the trim around the doors and the side windows a fresh coat of white paint. the front door was really filthy, and I cleaned it using WD-40. Can you believe that? All I did was spray down a rag with the WD-40 and wiped the door clean. It looks like brand new! That was a tip I found online, and I am soooo happy I tried it. I will forever clean my exterior doors with WD-40. 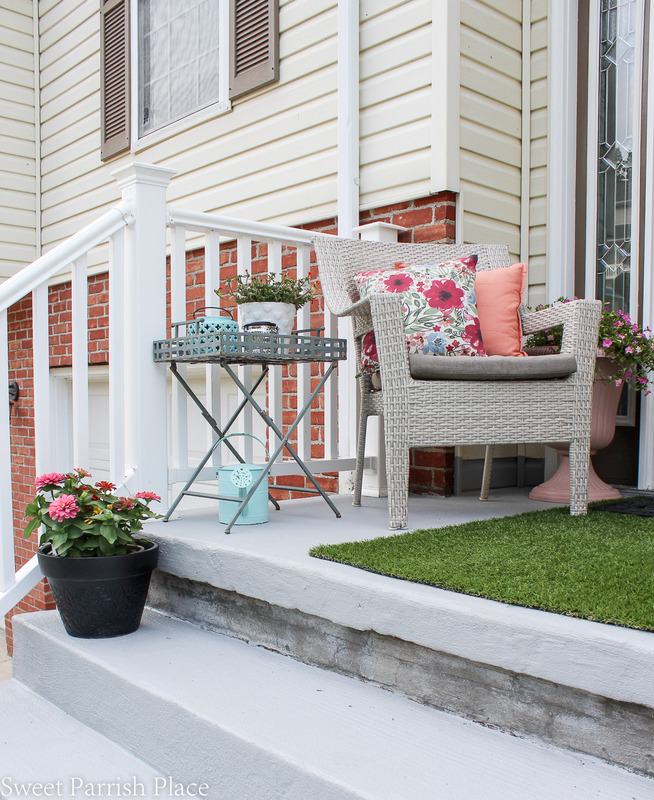 I hope you enjoyed seeing our new landscaping and summer front stoop today! 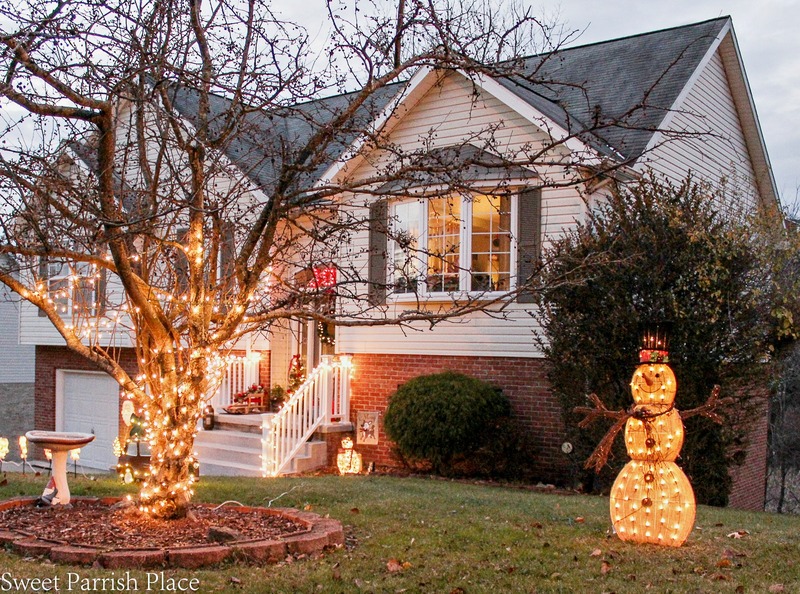 It feels so good to have the house looking nice in the front. And we are thrilled with the changes of the landscaping. Now, the back deck is another story completely. There is work to be done back there. Hopefully I can get it done very soon and share a little tour of our back decks soon. Enjoy the rest of your weekend! You have definitely made the most from a small porch. Love every detail. Thanks for the tip on the WD40. LOVE river rock! My fave! The landscaping looks great and smart idea to have it installed. 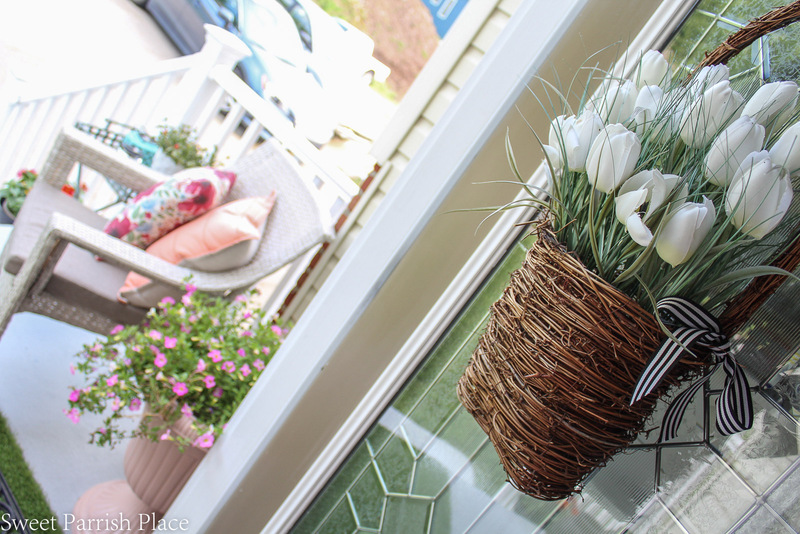 Every idea on your porch is perfect to me! I have a very small, strange porch on my Forever home and you gave me ideas. Hi Rhonda! Thank you so much, and I’m so glad you are inspired by my small front stoop! You did a great job, and I will be pinning this, because you have inspired me to make a few changes to my own front yard! We had a bush very similar to yours that I pulled out years ago. 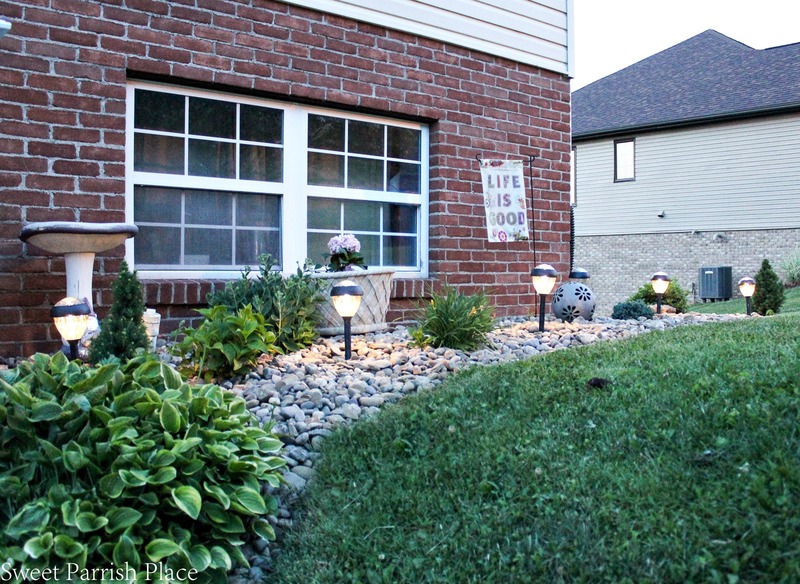 One of the best curb appeal decisions I ever made! Thanks so much for pinning it! It’s amazing how pulling out an old bush can change things! 15 years ago built a house with a large wrap around front porch. Its beautiful . Really? so cool! wrap around porch is so dreamy! 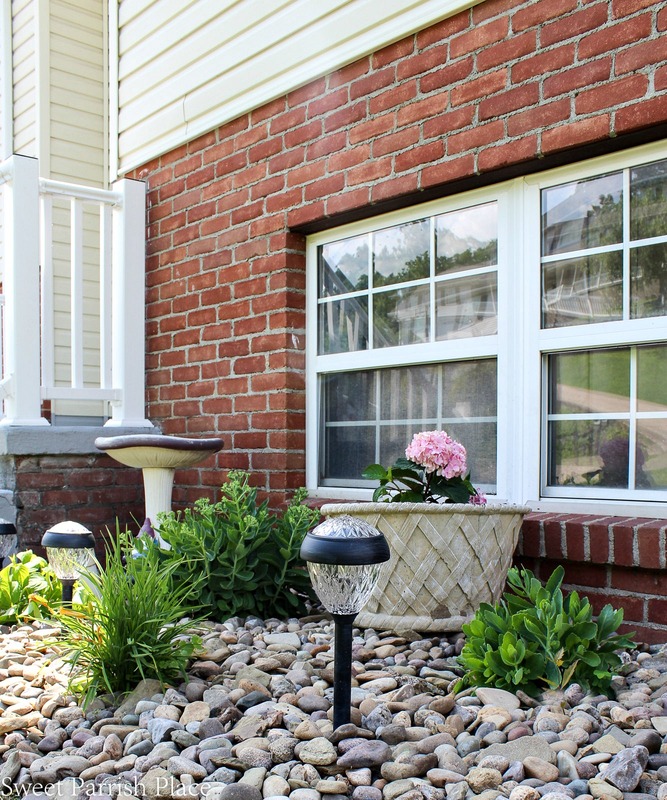 Make your house more appealing with the right renovations by adding some landscape garden. 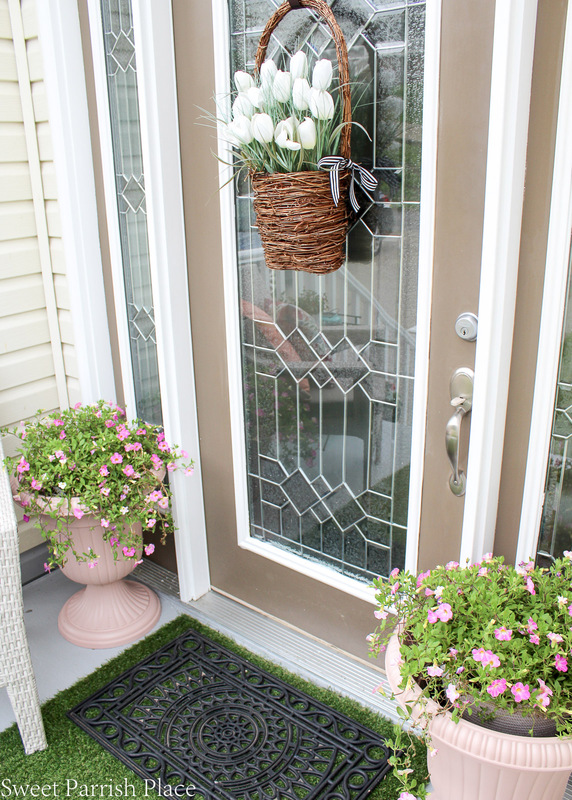 The landscaping and the porch look fantastic. I really like the blush color and the idea to put the big solar lights on the table. Zinnias are a great flower, so pretty. Thanks for sharing at Merry Monday. See you at the party next week. Hi Nicki, your ideas are very nice. 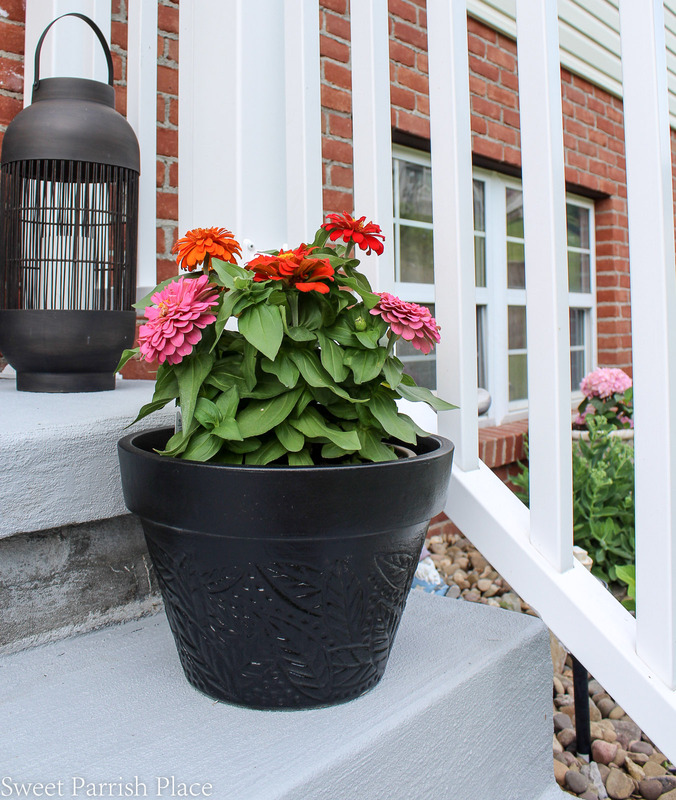 Your landscape and porch looks amazing. 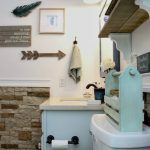 You have inspired me to make improvements in my own yard with the help of your blog. Thank You so much for sharing the blog. Keep posting! I cannot wait for Spring. I have to start and keep all my plant inside until May though because it stays cold usually through that time of year. Great improvement look on your front yard, it’s a success! 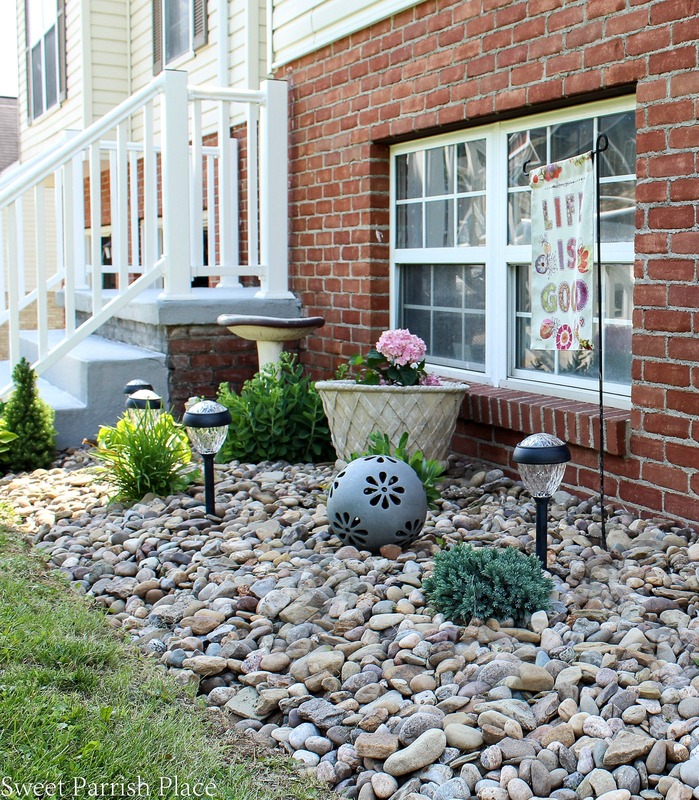 I agree with the landscaper to go for the mulch instead, your newly installed ensemble will even look prettier when the plants and pine trees have grown. 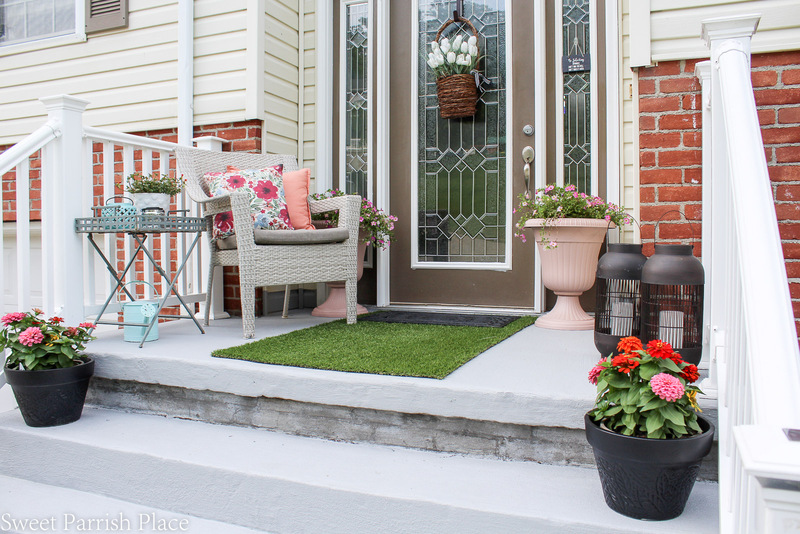 Your front porch looks very lovely as well, all it needed was a touch of fresh paint. Great article and thanks for sharing!